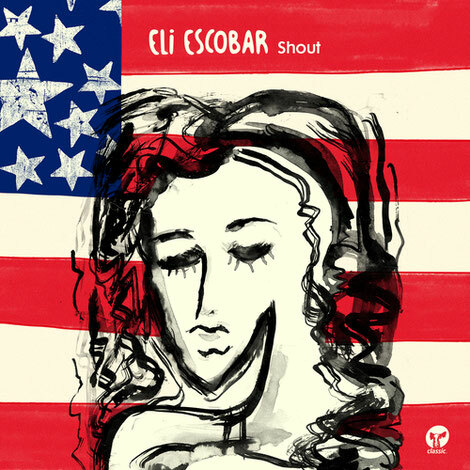 Just over a year on since he released his LP ‘Happiness’ on Classic Music Company, Eli Escobar returns to the label with an album which couldn’t be further removed in sentiment. Whereas ‘Happiness’ radiated house/disco hybrid throughout, ‘Shout’ is a heartfelt rage against America’s developing political disasters. The New York City DJ is a devoted collector, explorer and connoisseur of all kinds of music from his hip-hop roots. Apparently he is well-respected in the New York club circuit after over two decades of mutual love for the city and the house scene. Having been switched on to Eli by his debut album ‘Up All Night’, Classic Music Company is now his creative home. ‘Shout’ starts with ‘Nightmare Rag’, police sirens ringing out in the background while a disgruntled voice repeats “ode to America” and a piano riff gathers momentum, turning into a punchy acid beat. Giving way to tangible heartbreak in ‘Interlude (American Sorrow)’ with lamenting saxophone and light percussion, Eli maintains the political message in ‘The People’, urging the listener to wake up by using vocal samples and hypnotic chords. Further highlights include heavier tracks like ‘Muzik’ which picks up the pace of the record, before ‘City Song’ brings back the New York house vibe with vocal cuts and warm synths. ‘City Song Part 2’ and ’Body and Soul’ show Eli’s disco influences while ‘Goin’ On?’ flickers with hope. A departure from the glowing balminess of his previous LPs, ‘Shout’ addresses Eli’s anguish over his country hitting self-destruct, while still putting his own twist on his city’s house and disco soundtrack, joining the dots between yesterday’s golden era classics and today’s club anthems.